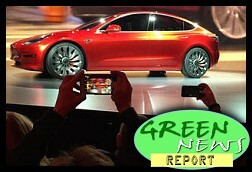 IN TODAY’S RADIO REPORT: New report finds climate change is going to kill a lot of Americans; The Keystone Pipeline springs a leak; Good news and bad news for California’s epic, historic drought; Another heat wave hits Alaska; PLUS: Customers flock to reserve Tesla’s Model 3, which doesn’t even exist yet… All that and more in today’s Green News Report! Got comments, tips, love letters, hate mail? Drop us a line at [email protected] or right here at the comments link below. All GNRs are always archived at GreenNews.BradBlog.com.